Perfectly Created Chaos! : Keepin' it Simple. What a busy day yesterday! We went school supply shopping and got the oil in the car changed and did a lot of little things around the house and we played outside for a while too. I didn't get a chance to sit down and stamp until about 4:00 yesterday and then when I got done it was time to start dinner and so I didn't get a chance to post anything. I actually made two cards yesterday, which is amazing given my complete lack of Mojo on Monday. If you saw Kristina Werner's MACM video this past week, the first card will look very familiar to you. I just loved the card and realized I had all the same materials and thought I would make my own version. I didn't have any of the Ranger paint daubers that she did, so I used a sponge dauber from SU and some acrylic paint and did my background with that. I used Kraft and Cameo Coral for my colors, with Chocolate Chip ribbon. It was super easy to put together and only took about 15 minutes to complete. The second card is for yesterday's MMSC 17 challenge. Now, I looked at the ske tch at about 8:00 yesterday morning; but didn't get around to doing it until later in the afternoon. I didn't go back to review the sketch before I started on it, so I was relying on memory. After I did it, I realized that I forgot the horizontal piece across the top. I really wanted to keep it simple. I don't know about you, but sometimes I really overthink my crafting process. I decided to just go with what I was thinking as I was thinking it instead of trying to plan and replan and then do. So, I grabbed some Grey, Sage Shadow, Ruby Red and Baja Breeze and used those as my color. I had not used my Fresh Cuts notes or that set in a long time and it seemed appealing for the layout (as I could remember it at the time) Again, this was a quick card and 30 minutes later this card was the result. So, that's all for me today. We've got another busy morning; but I plan to do a bit of blurfing later. Until then, have a great day! Really love colors and I love that flower!! The MMDesign Team thanks you for playing in our challenge. We will be looking forward to seeing your card for next week. What a lovely creation. The elements come together for a superb and impressive effect. Thank you for playing MMSC this week. Looking forward to seeing more of your artistry. What a beautiful card!! 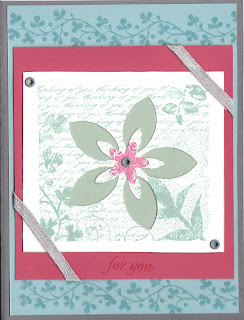 I love the stampset and you have inspired me to take it out and use it again soon. Thanks for playing with the MMSC this week!! This card is just lovely. Love your background stamping. Great take on the sketch challenge. Thanks so much for playing along with us at Midnight Madness!